Julie has been working with horses and youth for over ten years. She began working with horses as a young, horse-crazy girl, and it turns out it was not just “a phase” as her parents originally thought! She went on to compete in the Hunter/Jumper world as a teen and through college, where she began to combine her two passions of being around horses and working with kids. Julie majored in Equine Studies at Virginia Intermont College and graduated with a degree in Outdoor Education from Warren Wilson College. 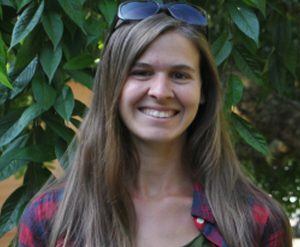 After college, Julie worked with adolescent girls at several therapeutic boarding schools and wilderness programs before joining the AAG family. She enjoys horseback riding (of course! ), knitting, gardening, playing the banjo, and hanging out with her many pets.